Chad Withers, front row, far left, recently attended West Point Leadership Academy. Withers hopes to attend West Point after graduating from Hannan High School in 2016. That’s what a 17-year old Hannan High School Student is doing in his attempt to be admitted into the United States Military Academy at West Point. Only Chad Withers isn’t just dreaming big, he’s working to make that dream come true. 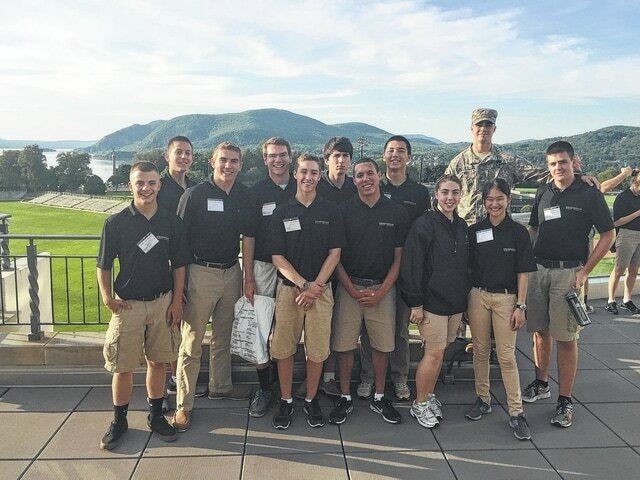 Recently, Withers attended the West Point Leadership Academy where he was exposed to what life at the prestigious school would be like, if he makes it in and he is determined to make it. Withers will be a senior this fall at Hannan Junior/Senior High School. The son of Charlie Withers and Tammy Toney, the military runs in his family, including his father who served. Withers said he’s known since he was a kid he wanted to be in the military and graduating from West Point would get him into a leadership position with his sights set on being a platoon leader or Army Ranger. Of course, a lot of people have dreams of being an officer in the military, but Withers is doing the work. After hearing about West Point’s Leadership Academy, he began the pursuit of being accepted which was no easy task. Withers enlisted the help of his guidance counselor, Jessy Scott at Hannan. Scott said Withers came to her with the idea and though she thought it might be a “long shot,” they were both determined to give it a shot. “It took off from there,” Scott said about the application process which included demonstrating Withers’ capabilities as a leader as well as his solid academic performance and extracurricular activities at school and in the community. He also had to write an essay on why he needed to be chosen for the academy and had to have nomination forms on his behalf. This is basically a scaled down version of applying to attend West Point after high school. Withers said the experience of the leadership academy was one he will never forget. “It was shocking getting off the bus,” he said, explaining everyone was immediately treated as cadets who were getting yelled at by senior staff, just like in the movies. Withers found himself with young people from around the world, from places like Germany, Brazil and of course from across the United States. “I was known as ‘that guy from West Virginia,’” he said, underscoring how unique his dream is for this area while in a place where he was uniquely “the one” from the Mountain State, at least in the circles he was in. But, beyond the initial and exhilarating shock, was a place where Withers said he felt at home in terms of the organization and structure, as well as the attention from the teachers. “You could tell they (teachers) really wanted to help you succeed…they were very involved in helping you succeed,” he said. His days also consisted of waking up early each morning, running, more yelling and learning about weapons. His favorite part of the trip to West Point was, however, the engineering classes of which he took three. In the classes he learned to build bridges, work circuit boards and be a part of a team. “It makes me want to work even harder to get there,” Withers said about his experience at West Point. As a guidance counselor, Scott said she’s never helped a student get into this type of school as most students stay local. So, it’s a challenge for them both, one they are both working to make happen. Withers even brought Scott of poster of West Point to inspire her and him. In smaller communities, educators can become especially attached to their students. Next up for Withers is keeping his grades up, continuing to display his leadership abilities and getting letters of recommendation from elected officials from West Virginia. His application will likely be submitted in early fall and he should know early next winter if he made the cut.